The Ben-Hur Racer, the white building to the left of Rocky Road. 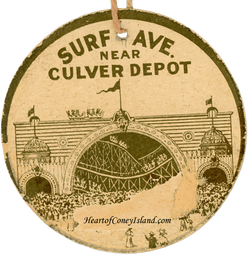 This remarkable ticket is for the Ben-Hur Racers, a small roller coaster located on Surf Avenue directly across the street from Dreamland. 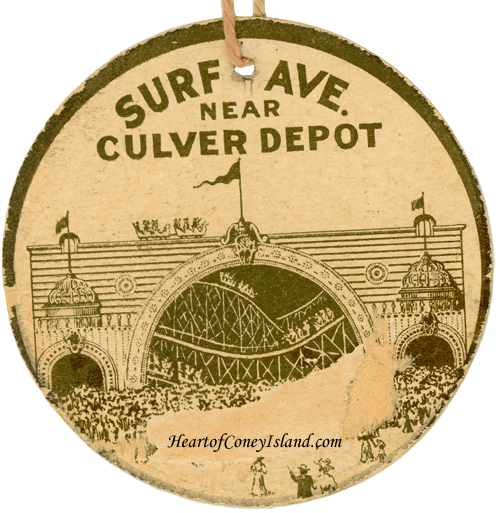 It was built during the 1908 season and began operating around September of 1908. It replaced the Albemarle Hotel and went in next to the much larger Rocky Road to Dublin. It was a dual-track "racer" coaster (see the Star Double Toboggan Racer for explanation). 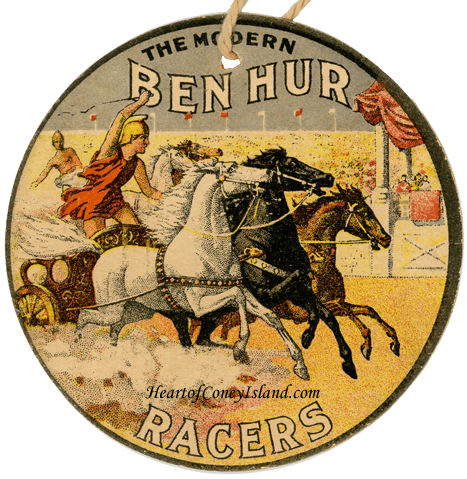 Ben-Hur was a really clever name for this racer-style roller coaster for several interesting reasons that may not be immediately evident to someone today. To see why, start with the premise is that anyone around in 1910 immediately would have recognized "Ben-Hur" as the best selling American novel of all time. Written in 1880, it's about a Jewish prince called Ben-Hur who is forced into slavery through no fault of this own. 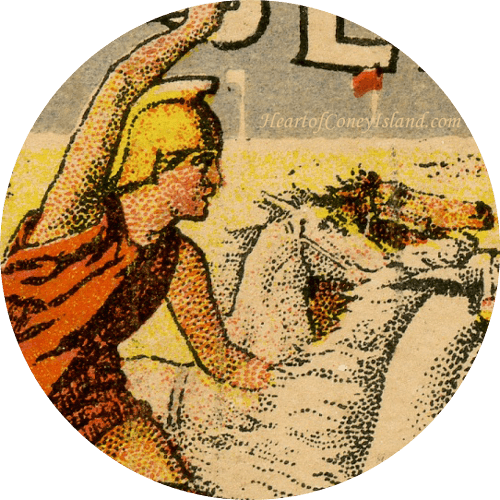 He competes in dangerous chariot races and overcomes a series of other personal misfortunes by finding redemption through converting to Christianity. 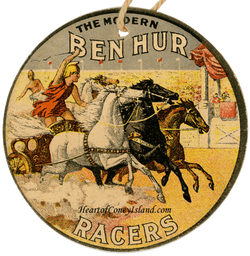 Calling the ride "Ben-Hur" back then therefore is similar to Disney or Universal Studios building a new ride in Orlando today and naming it after Harry Potter or Batman. It's good marketing. There's also the very appropriate chariot racing theme for a "racer" roller coaster. What is less obvious today is how important the religious theme from the Ben-Hur novel could be in making the ride socially acceptable and attracting incrementally more riders. After all, nowadays, it's hard to imagine just how powerful a social force religion was in the late 1800s, and albeit to a lesser degree, even in the very early 1900s. Let's not forget the temperance movement was able to successfully institute Prohibition in this country even as late in 1920! Imagine that you're working six days a week because the five day workweek still hasn't come about. It's Sunday, your only day off, and you want to have a little fun, either just you or taking your family if you have one. However, having pure fun on the Christian Sabbath is seen as socially distasteful by some relatively significant groups of people. Not that they're likely to see you hanging out at Coney Island anyhow, as Coney Island isn't exactly known for its rigid moral standards at this time. But keep in mind that we're talking about a society in which many towns, just a few years earlier, had banned circus performances on Sundays unless the shows could prove they were educational or religious in nature (see the P.T. Barnum Circus Captain Paul Boyton poster from 1887 for more details on this). 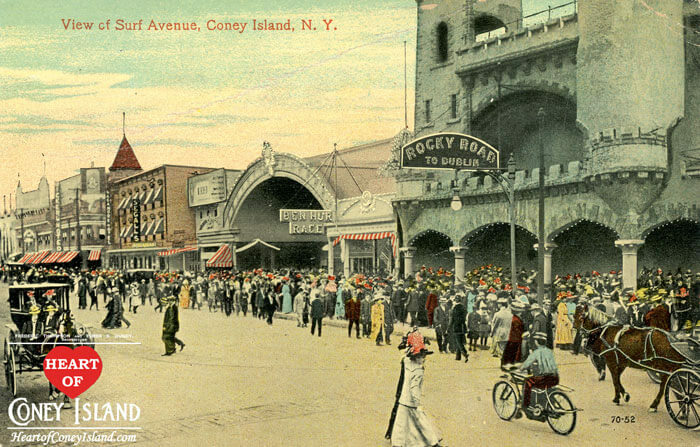 Even though many people would go to Coney Island specifically to get away from the rather oppressive social norms of the era, a certain percentage of the population still would find it more palatable to go on a ride that operates under the loose guise of some type of religious wrapper, all else being equal. And this could, in turn, be the tie-breaker between mom letting the kids ride the Ben-Hur versus another roller coaster. So, all-in-all, Ben-Hur was an excellent choice for a name for this racer.